ASTRON | Where is Yvette? 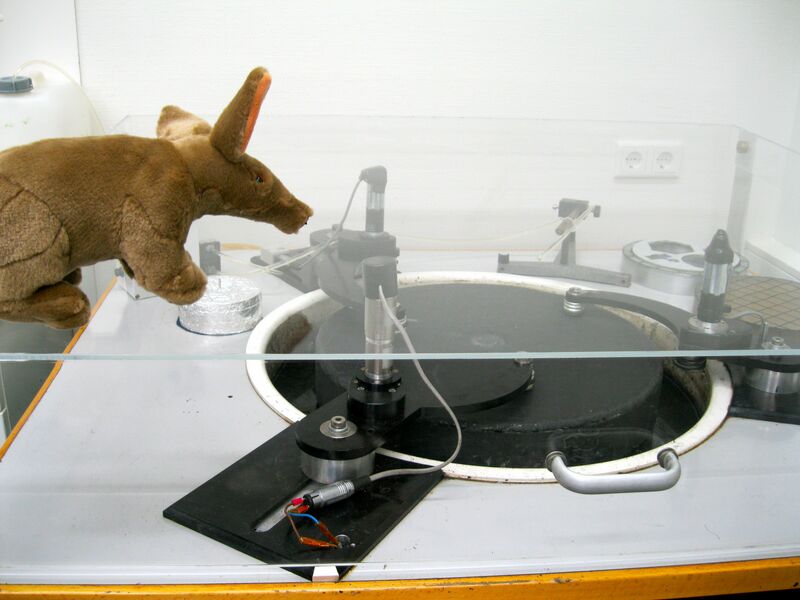 To continue our series with Artie, everyone’s favorite aardvark, here is the little scamp exploring the Westerbork Synthesis Radio Telescope (WSRT). On the last day of Nova school we spent the afternoon going to see the Westerbork radio telescopes, which is about 20 kilometers from ASTRON. 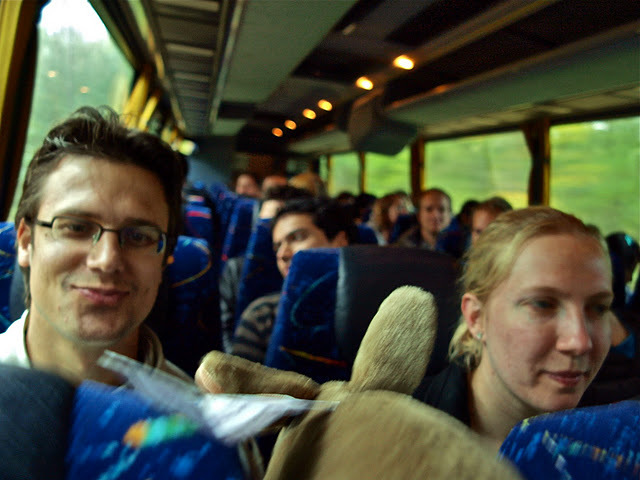 I passed my time on the bus ride making friends with all the astronomers. After a long drive through the rain we made it- hooray! The telescopes looked awfully impressive, as all 14 of them were pointed in the same direction tracking a source in the sky. Here is one of the telescopes up close. 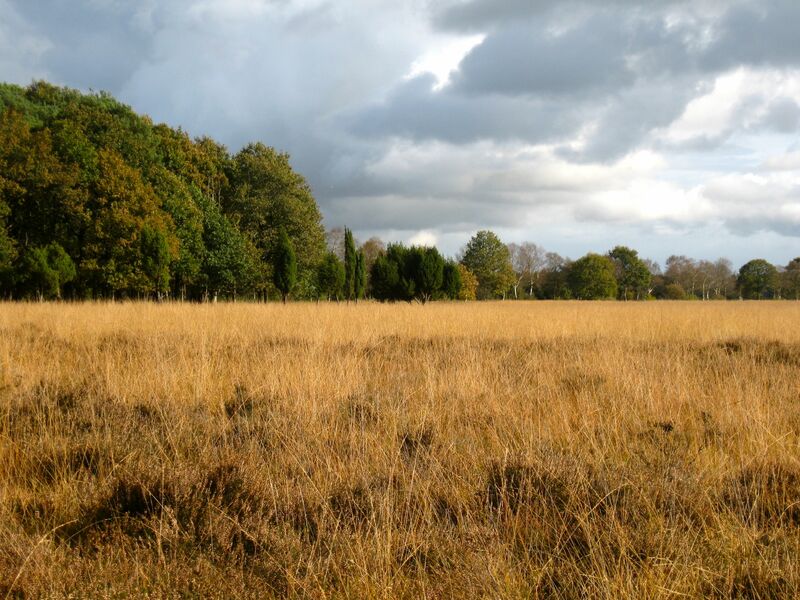 The Westerbork telescopes are interesting because they have an equatorial mount, meaning one axis is parallel to the Earth’s rotation, and most radio telescopes have azimuthal mounts. 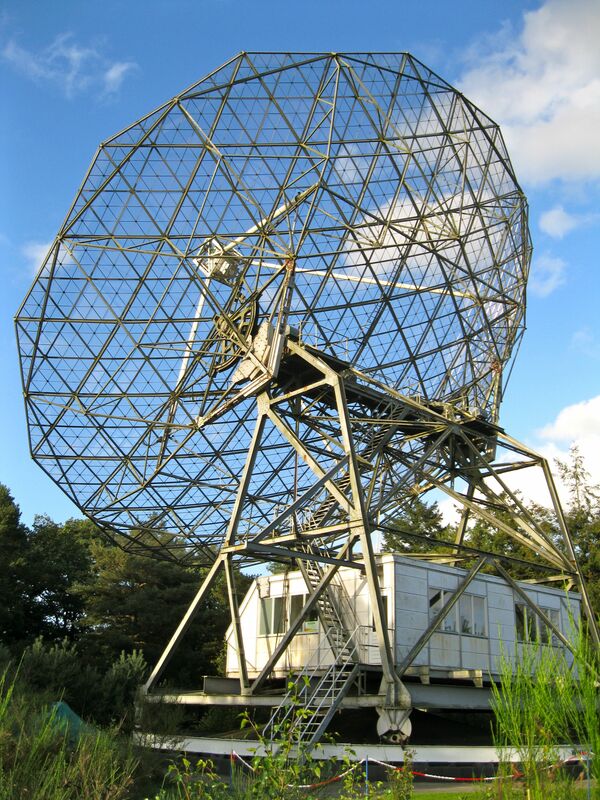 This means the Westerbork telescopes can track something in the sky by moving only one axis, but most radio telescopes require two! After the telescopes detect a radio signal all that information comes here to the correlator, where all the signals are put together so the astronomers can analyze what they see. There were lots of wires running everywhere- it looks awfully complicated to run a radio telescope! 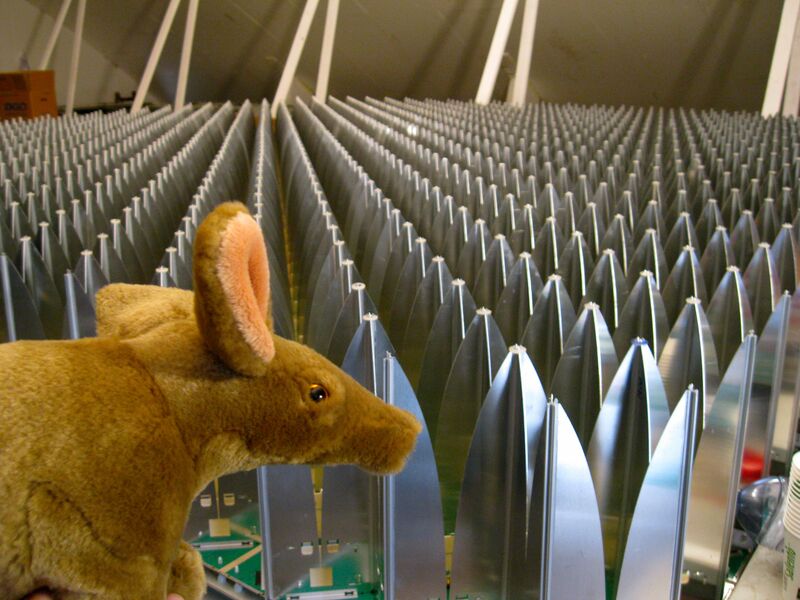 I also got to see a test of the next generation technology for radio telescopes called EMBRACE, which looked like a giant field of spikes if you ask me. Basically over the next decade or so radio astronomers are hoping to build the Square Kilometer Array (SKA) which will do exactly what the name sounds like, put an array over an entire square kilometer. Wow! Something very, very big like that also needs parts that aren’t too expensive, so they’re hoping to use EMBRACE to show how this telescope of the future will work exactly. I was also excited to learn that next year they will announce the location of the Square Kilometer Array, either in western Australia or South Africa. 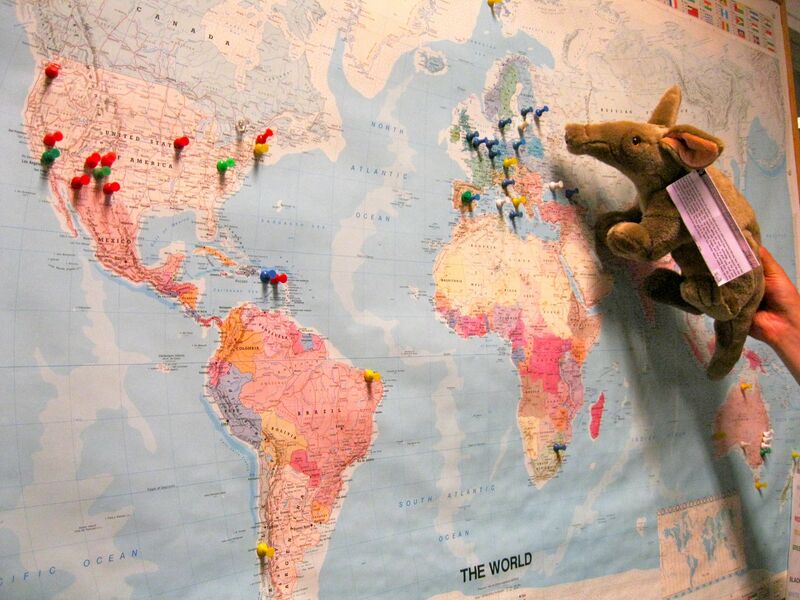 I’m crossing my paws for South Africa to be picked of course! And after all that excitement I was tired, and snuggled into a pouch in Yvette’s poncho- Hmmm, these kangaroo-style pouches are quite comfy. Perhaps I won’t mind if they build the SKA in Australia after all! 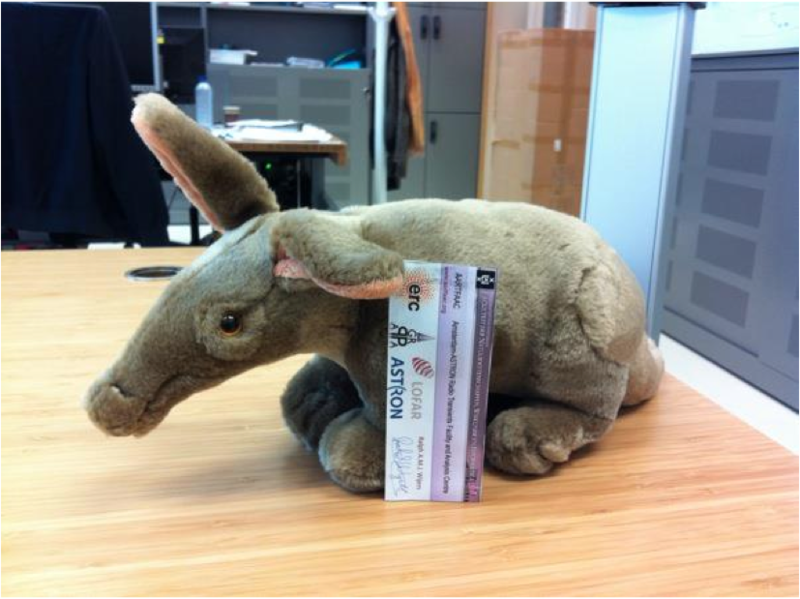 Before we begin, I’d like to introduce you to my new friend Artie Aardvark. 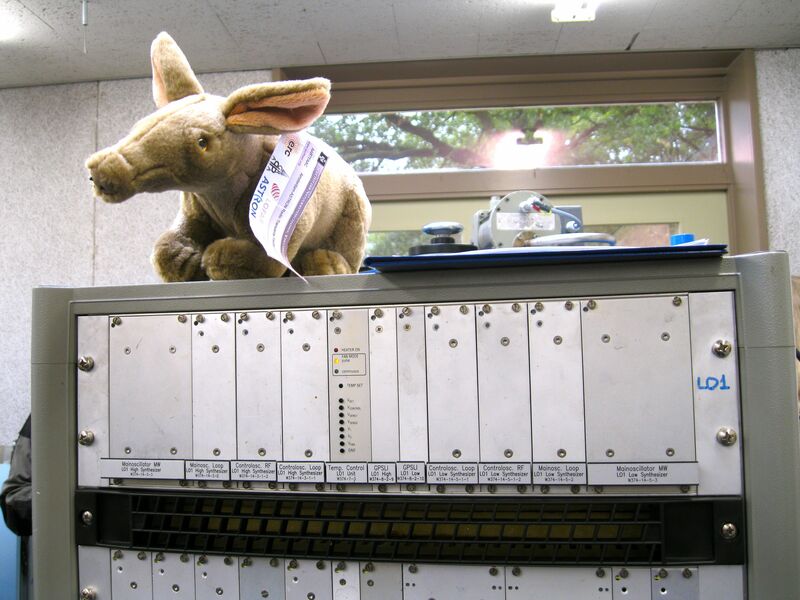 Artie is the mascot of the AARTFAAC (pronounced “aardvark”) project that I work for at the University of Amsterdam, where we look for transient radio signals from the sky. 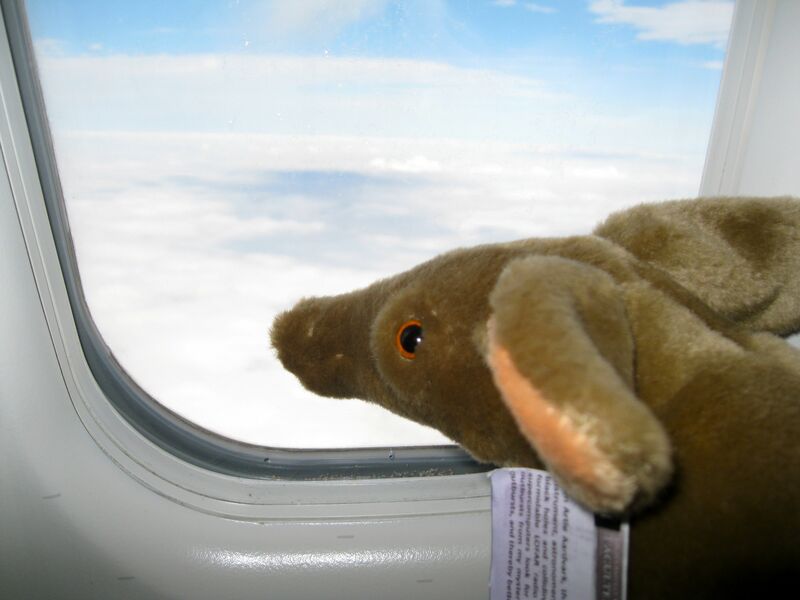 Because Artie takes his job seriously he has volunteered to explain Interesting and Important Astronomy Sites this blog may visit, as he rightly assumes that he can explain technical stuff in a better and cuter way than I would myself. 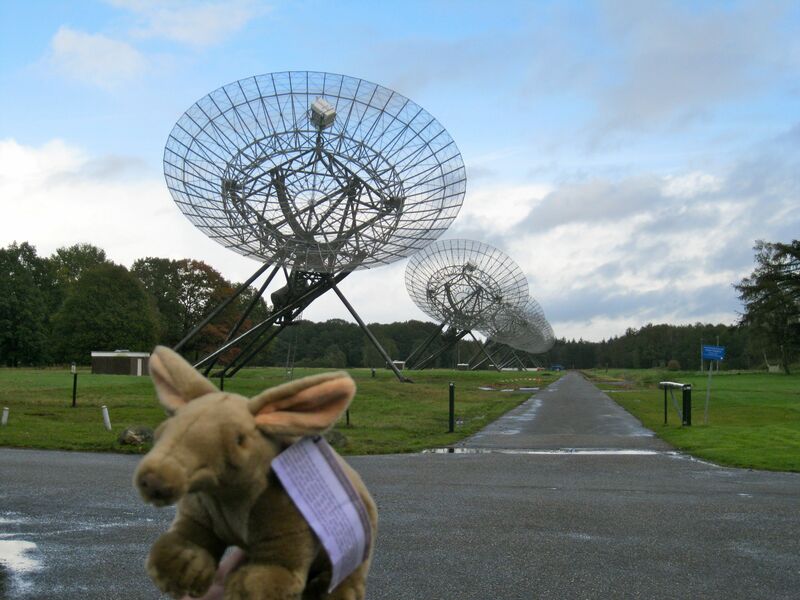 So with that I give you Artie’s Amazing ASTRON Adventures, where ASTRON is the Netherlands institute for radio astronomy ~100km east of Amsterdam. Oh my goodness I’m so excited, I’m on my way to ASTRON to see what astronomers do! 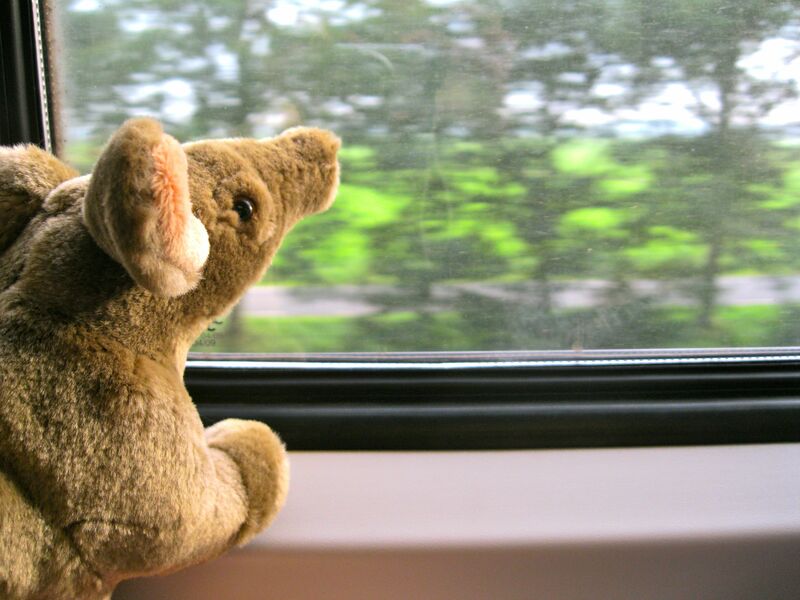 Here I am on the train looking at the Dutch countryside. It is very flat and filled with farms so far as I can see. 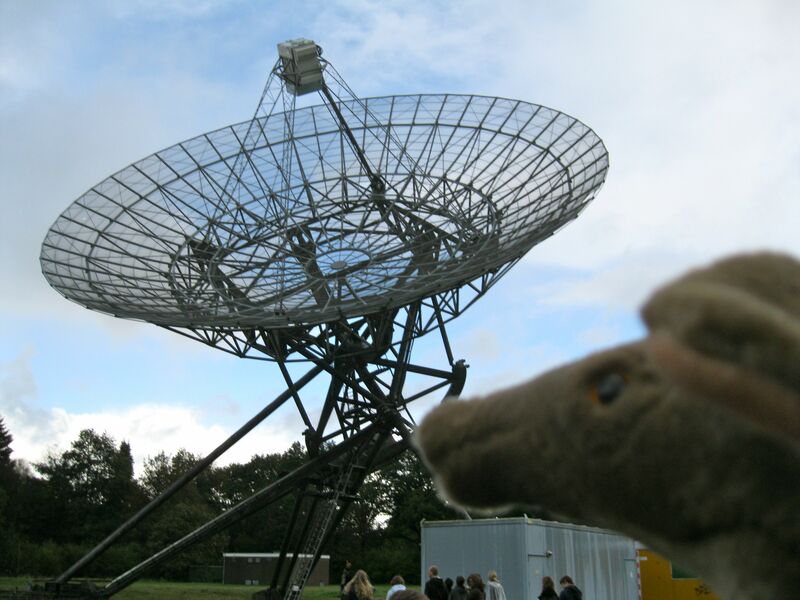 When we made it to ASTRON I could tell because the Dwingeloo Radio Telescope was poking out of the trees! 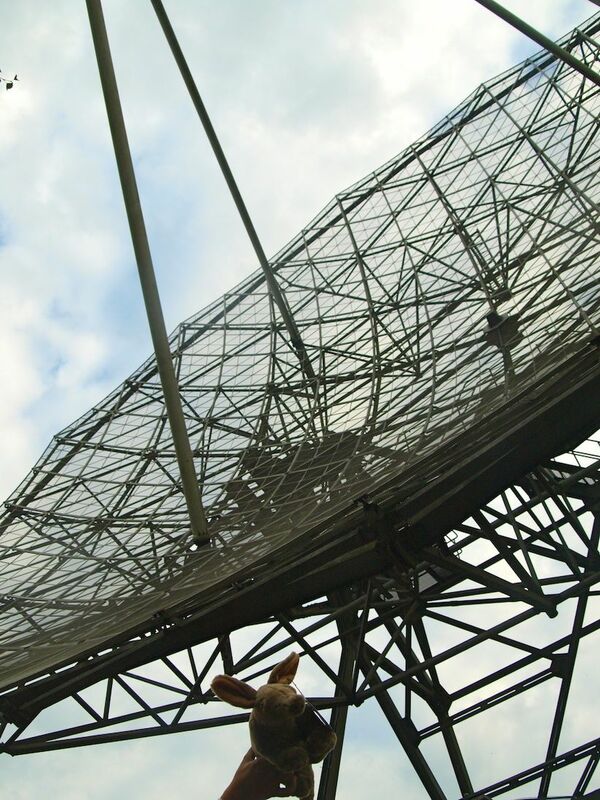 This was the biggest radio telescope in the world in the 1950s, but now is used by hobbyists. They do things like detect neutron star pulses and talk to people in around the world by bouncing radio signals off of the moon. It sounds like a fun hobby to me! Nowadays at ASTRON the astronomers help build and run lots of astronomy projects all around the world, and some are even in space! 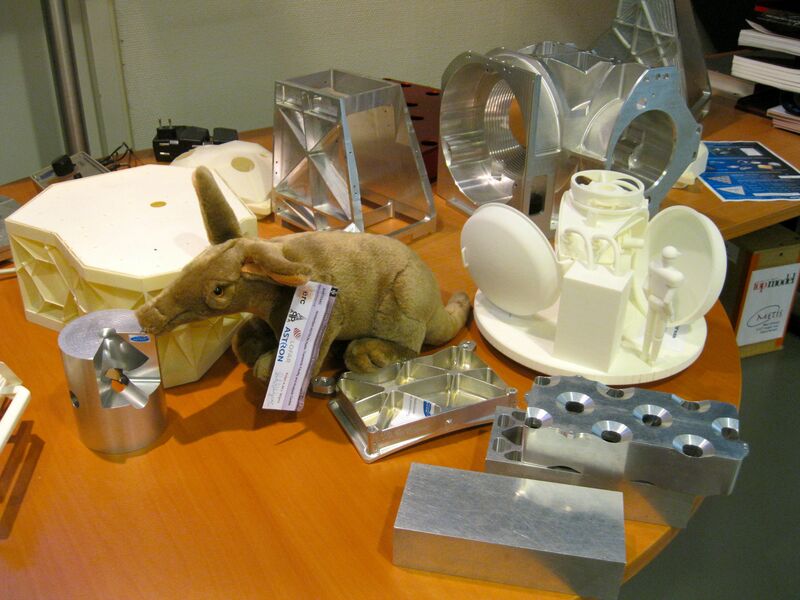 Here I am inspecting some models of instruments ASTRON is working on for future projects. I also liked the aluminum blocks on the right side of the table, showing how a heavy solid block could be made a lot lighter by drilling and hollowing out the inside. I also got to check out a mirror polisher up close that is used to give a telescope mirror the right shape. I was amazed to learn that “right shape” for astronomers can mean within the thickness of one of my hairs! 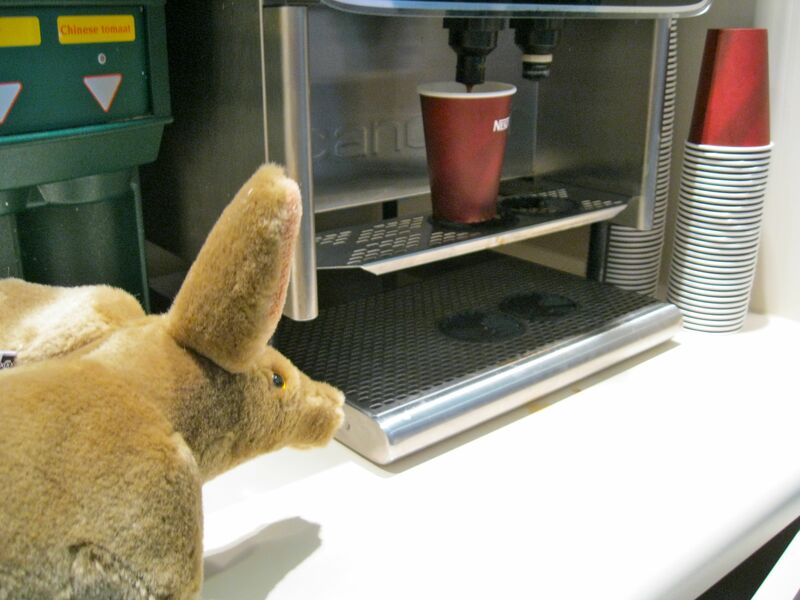 … which was good because I was alert enough to help the engineers keep an eye on things at JIVE headquarters! 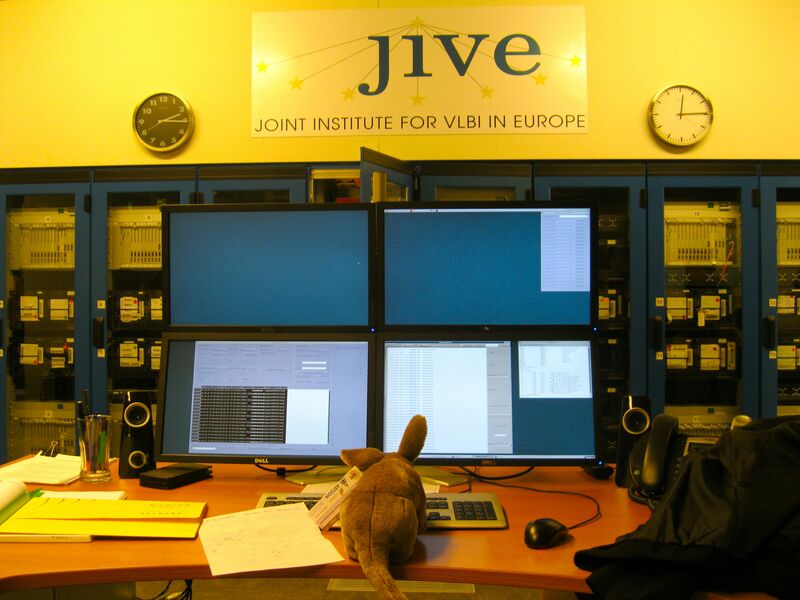 JIVE is short for Joint Institute for VLBI in Europe, and VLBI is short for Very Long Baseline Interferometry. It is funny that astronomers like acronyms so much that they have acronyms of acronyms. JIVE is really cool because they take radio telescopes from all over the world and link them together to make more detailed observations than if you were just using the one telescope. They can do stuff like pinpoint where a mission orbiting Mars is within meters! This map shows where telescopes involved with JIVE are around the world. 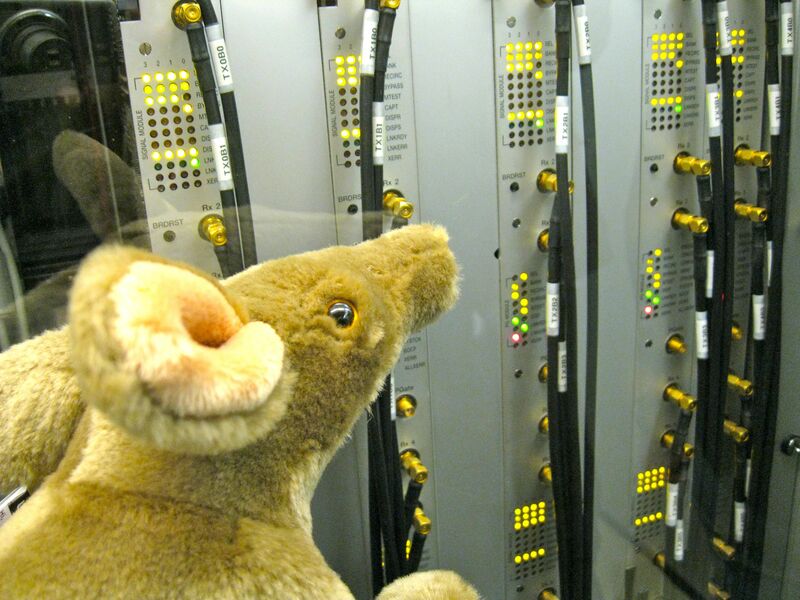 And all those signals end up here in Holland! 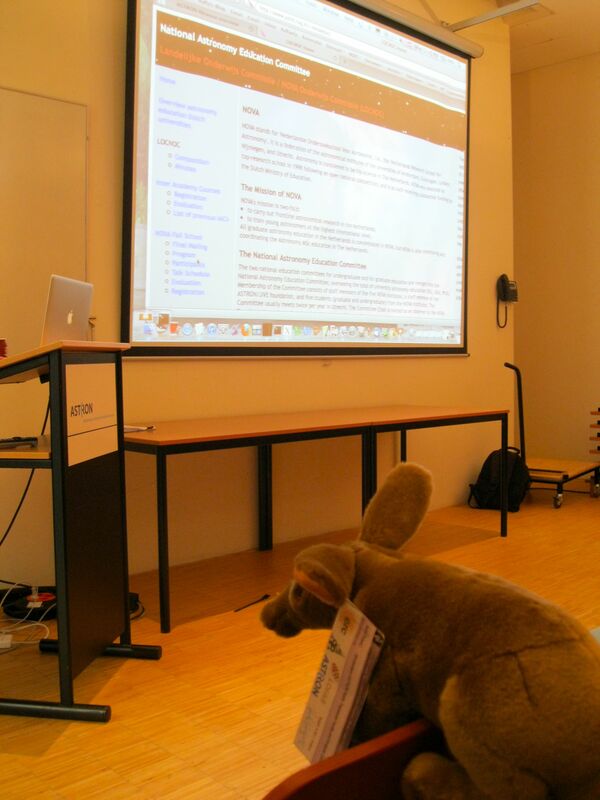 Tour done, it was time to listen to some lectures. 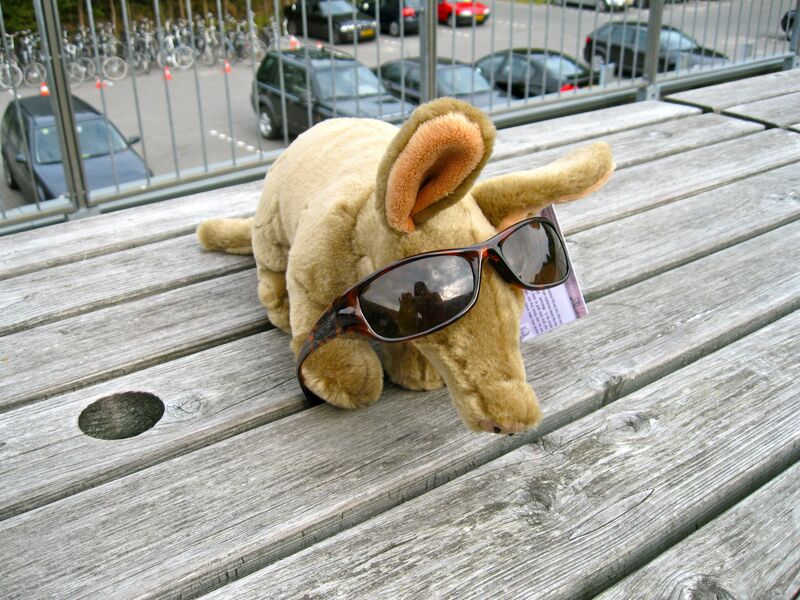 Yvette was at ASTRON this week for Nova School, a program aimed at first year astronomy PhD students in the Netherlands, so there was a lot of learning for a little aardvark like me. At least I could help Yvette with her talk on AARTFAAC! 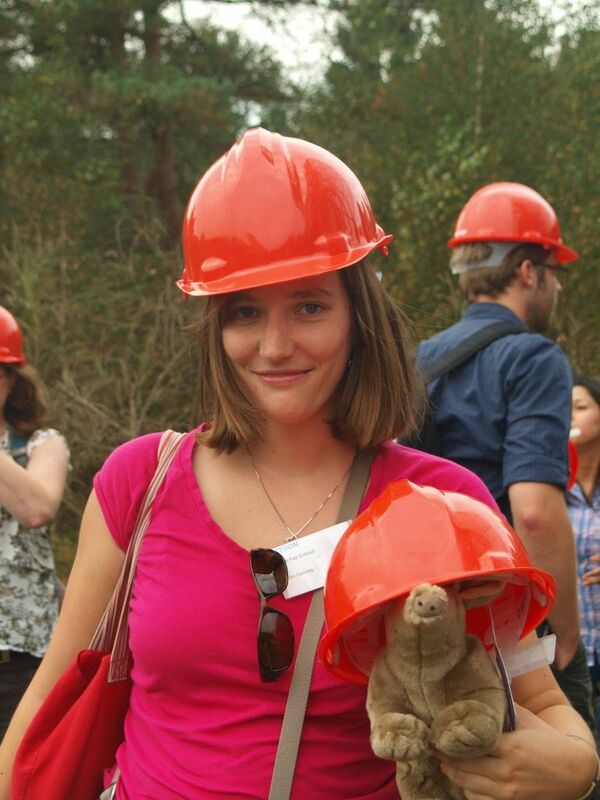 She and my other friends on the team are hoping to monitor the night sky 24/7 to find rare radio outbursts from mystery objects like neutron stars and black holes, and I’m excited to see what they find. After all that it’s time for a rest, so I’ll talk about some other adventures later. Thanks to Daniela for helping with the pictures!